Starting in 2012, we observe the 50th anniversary of the Second Vatican Council. Pope John XXIII announced an ecumenical (universal) Council for the Church in January 1959 -- for three years the world's Bishops prepared for the Council -- and Vatican II met in four sessions from 1962 to 1965. Re-live the history of the Council at this blog, week-by-week. "EX CATHEDRA" ("From the Chair") is THE STORY OF BISHOP DUGGAN (1825-1899). Monsignor Myler is the Rector of the Cathedral of St. Peter in Belleville, Illinois. He was ordained a priest in 1982 -- and his doctoral research and dissertations have focused on the history and theology of the Church in the United States. His research on Bishop James Duggan has included time at the Archives of Propaganda Fide in Rome; the Bernardin Archives of the Archdiocese of Chicago; the Archives of the University of Notre Dame; the Archives of the Archdiocese of Saint Louis; and the newspaper archives and the records of St. Vincent's Asylum at the Missouri Historical Society. I notice in my body the beginnings of some trouble that must be natural for an old man. I bear it with resignation, even if it is sometimes tiresome and also makes me afraid it will get worse. It is not pleasant to think too much about this; but once more, I feel prepared for anything. Pope John knew -- before the Council sessions began in October 1962 -- that he suffered from the stomach cancer that ran in his family. The four-hour ceremony of the Solemn Opening of Vatican II, which included a 37 minute address by the Pope -- Gaudet Mater Ecclesiae -- took its toll on Pope John, exhausting him. 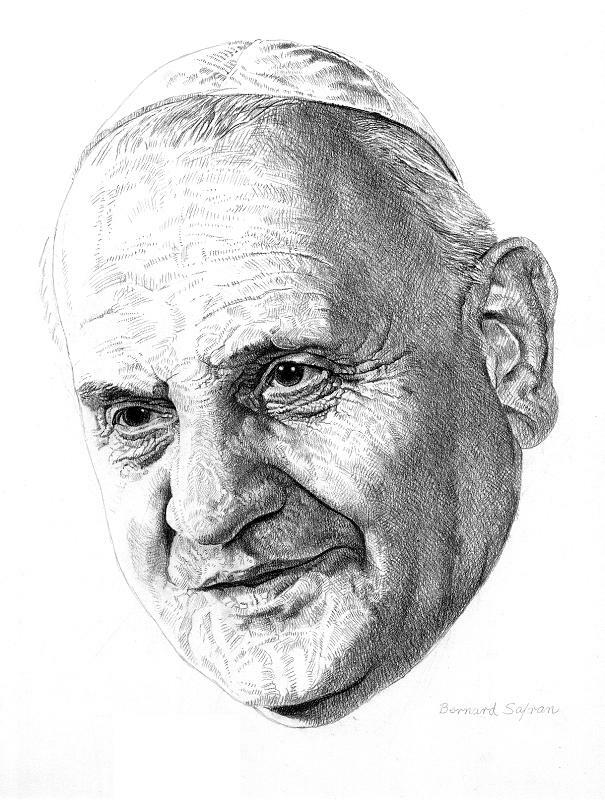 Although he did not attend the Council's daily sessions during the autumn of 1962, the 81-year old Pontiff followed the Council's deliberations from the papal apartment. He was well aware of the lack of progress during the First Sessionand that, quite apparently, Vatican II would last longer than one session. Pope John knew that he would not live to see subsequent sessions. On November 27, 1962, the Pope suffered a massive gastric hemorrhage. By December 8, when he slowly processed into the Basilica to preside at the close of the First Session, the Council Fathers could see for themselves the physical effects of the Pope's sickness. The word "cancer" was not used publicly; the official line of the Vatican was that the Pope suffered "from a cold." It was apparent to the assembled 2,500 Bishops and to the people of Rome that Pope John was unlikely to live through the new year 1963. -- He began Lent, as papal tradition dictated, at the stational church of Santa Sabina in Rome. He continued to visit parishes. -- He made it through the joyous but lengthy Easter ceremonies of April 14. 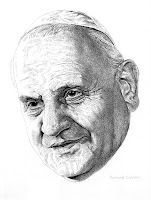 -- On May 10 and 11, Pope John received the Balzan Peace Prize. At the end of the award ceremonies, he appeared almost totally exhausted. Pope John XXIII had less than a month to live. Loris Capovilla was a 37-year-old priest of of the Patriarchate of Venice when the new Cardinal Roncalli chose him to be his personal secretary. Capovilla accompanied him to the Conclave in 1958 and stayed by his side throughout the Johannine pontificate. 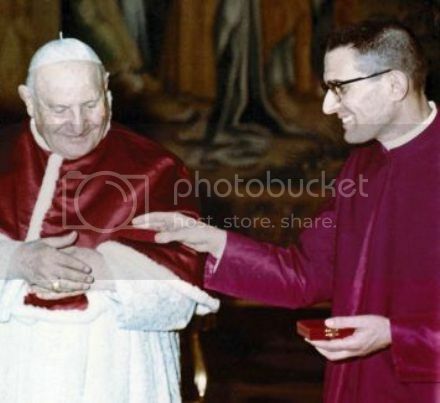 In the last days of May, 1963, it fell to Monsignor Capovilla to tell Pope John -- after a series of hemorrhages and subsequent tranfusions -- that the doctors had done all that they could. It was too late for surgery. "The cancer has, at last, overcome your long resistance," Capovilla told him. "Help me to die as a Bishop or Pope should..."
On Thursday, May 30 the Pope suffered a massive hemorrhage, which left him in great pain. Doctors administered sedatives; John slipped into unconsciousness. By Friday, the 31st, there were signs of peritonitis. The Pope's confessor was summoned to the papal bedroom in the Apostolic Palace, as was the Papal Sacristan. Pope John received the Blessed Sacrament as Viaticum ("food for the journey") and the anointing of the last sacrament, Extreme Unction. He regained some consciousness. On Saturday, June 1, there were gathered into the dying Pope's bedchamber his several doctors; Monsignors Capovilla and Samore; Cardinal Cicognani, the secretary of state; other senior prelates of the Vatican Curia - Cardinals Tisserant, Ottaviani, Copello, Aloisi Masella, Cento and di Jorio; the Pope's valets, and the nuns of the Papal Household who had cooked and cleaned and cared for him. Family members -- his surviving brothers and sister -- arrived from the North and also gathered around the bed. And in the background was Cardinal Montini of Milan; John had personally summoned him to be present. Montini was witness to the last days of the man who preceded him as Pope. "When all this is over, get some rest and go see your Mother." 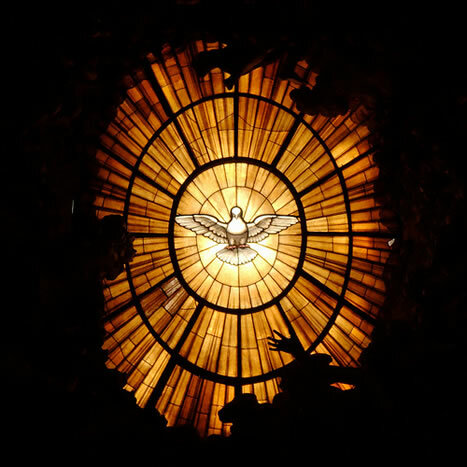 June 2 -- the last full day of Pope John's life -- was Pentecost Sunday. A Mass was offered in the nearby study; John was fevered and in-and-out of consciousness. At one point, he was able only to sit up a bit and talk briefly with his family, but then he began to gasp for air. He fell into a coma. A crucifix was placed in his hands - and in the early evening he mumbled a few words of the Regina Coeli, the Easter prayer he would otherwise have prayed with the crowds gathered in St. Peter's Square. "Lord, you know that I love you." Throughout the day, his breathing became more shallow, his pulse weakened. Once again, Mass was offered in the study, this time by the Cardinal-Vicar of Rome. At the moment Cardinal Traglia spoke the last priestly words of the Mass - "Ite missa est" ("Go, the Mass is ended") - the Pope died. ... had been Pope for only four years, seven months and six days. "Born poor, but of honorable and humble people, I am particularly happy to die poor, having given away, for the benefit of the poor and of the Holy Church that had nurtured me, all that came into my hands, during the years of my priesthood and episcopacy." Very touching accounting of the Pope's last days and death. Any citations for this account? I've seen him quoted as saying "end the council!". Although there was a difference of opinion regarding "continuing" the Council -- John was virtually certain that Montini (who was deeply committed to the cause of the Council) would be elected Pope. Virtually all the Council histories treat the "continuity" of the Council between the John XXIII's illness and the election of Paul VI. As noted above, the "timeline" re John's illness and death is taken from Burkle-Young's "Passing the Keys." Continuity would not seem to be an issue between two Masons, but even a Mason can have a change of heart when his death is approaching. If that statement was made by Pope John XXII on his deathbed, why was it not publicised and it was important enough because it was also stated by Padre Pio when he was alive! Could it be that this was part of the third secret of Fatima? Pope John certainly had doubts about the Council -- particularly after the rather chaotic First Session. However, Jean Guitton was not present at the death of the Pope ... and EWTN, so good for so many reasons, is not an authentative historical source. There's little doubt that Pope John offered his sufferings for the success of the Council. Yes, Guitton was a friend of Montini -- and yes, Paul VI famously spoke about the horrible smoke of Satan entering the Church. Perhaps the "smoke of Satan" refers to disobedience and lack of respect for authority in the Church.